The death has been announced this morning of one of the country’s most respected and successful fishing industry leaders, Joey Murrin from Killybegs. Mr. Murrin retired in 2000 as chief executive of the Killybegs Fishermen’s Organisation having spent almost three decades serving in Irish and international fishing politics. News of his passing has been met by deep sadness in Killybegs where he lived at Chapel Lane, and indeed across Donegal and the north west. The following year, 1974, he was voted chairman of the Irish Fishermen's Organisation and served for five years. In 1979, he left to set up the Killybegs Fishermen's Organisation as a producers' body and was also nominated to his first of several terms as director of Bord Iascaigh Mhara. It was in 1986 that he was appointed chairman of BIM by Taoiseach, Garret FitzGerald. The Taoiseach also encouraged him to stand for Fine Gael as a candidate in the European elections in Connacht-Ulster. Although Mr. Murrin was unsuccessful in that election, his influence in fishing negotiations continued to grow. 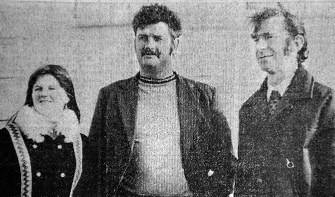 1974... Skipper Michael Doyle with his wife Paula and Joe Murrin, chairman of Killybegs Fishermen's Association. From 1995, he served again as director of BIM. On completion of that three-year term in 1998, he was appointed to the board of the Marine Institute. "The fishing industry has gone through massive changes since I first went to sea in 1954," Mr Murrin told a special KFO luncheon held to mark his retirement back in 2000. "From the simple hunting operation it was at that time, it has developed into a high-tech, high investment business, with vessels navigated by satellite and fish located and caught using systems undreamed of half a century ago." After 22 years as chief executive in the Killybegs Fishermen's Organisation and more than three decades serving at national and international level in fishing politics, Mr Murrin believed it was time to go. He had made his intentions clear several months earlier at the Killybegs group's annual general meeting, and such was his dedication to his role, he also promised that he wouldn't quit until a replacement had been found. He eventually stepped down on September 30st that year, but still made himself available for the crucial December fisheries negotiations in Brussels. Remains reposing at his residence from 7pm on Sunday, with removal on Tuesday morning at 10.45am to St. Mary’s Church, Killybegs, for 11am Funeral Mass. Burial afterwards in the local cemetery. Rosary at 9pm. Family time from 10pm to 11am.